On Tuesday (appropriately) Aaron, Henri, Dan and I met with Oren Jaffe and Nikki Martinez to strategize about the EcoTuesday juggernaut. The one problem with the meeting was that I was a few hundred miles away from the meeting. 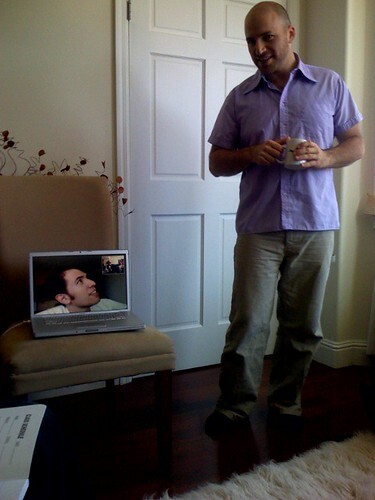 Thanks to technology were able to video conference. And, because of my amazing mastery of the The Force, I could tell where people in the room were, and in this picture (above), I’m looking right at Aaron, kind of like The Brady Bunch. EcoTuesday is a monthly networking event that currently takes place in San Francisco, but is soon to expand to other cities (and maybe even countries). The format is what makes it unique. Instead of just a happyhour schmoozefest, EcoTuesday provides structure and context for high quality social interactions between people working in the “green” fields. In just 5 months, attendance has soared from 50 people to 210 people and the event has filled up every month!